Right now, the smart money (and most polls) predict that the Senate will remain narrowly in Republican hands while the House of Representatives will likely switch from Republican to Democratic control. We don’t know for certain this will happen – polls misled us twice in 2016 with “Brexit” and Trump – but if the House comes under Democratic control, the unrest in our nation today may look tame by comparison. First, Nancy Pelosi will try to replace the current Speaker of the House Paul Ryan. She may have rivals, but whoever emerges triumphant will certainly have Donald Trump as his or her main target. All the other major Committees will throw out friendly chairmanships and bring in bitter opponents of the President. Maxine Waters may take over Financial Services, Jerry Nadler may command Judiciary; Elijah Cummings may replace Trey Gowdy on Oversight and Government Relations, and Adam Schiff may oust Devin Nunes on Intelligence – that’s like replacing a bodyguard with an enemy. Adam Schiff has a raft of anti-Trump subpoenas ready to issue once seated on his new Intelligence Committee. The Dems may not talk impeachment right away, but they would keep that big Trump card always available. The Democratic House will attack Trump’s tax records, his past business dealings, his Russian meetings (if any), and his every meeting everywhere with everyone. They may investigate cabinet members for corruption, including his children and his businesses. The House will also try (and mostly succeed) in blocking all his future legislation, like tax cuts, deregulation, trade reforms and other successful financial measures which have marked Trump’s first two years in office. The House will likely slow down this great (4% GDP growth) economy, causing a swoon in the stock market and perhaps a recession by 2020. In such an uncertain environment, it is likely that the stock market will not respond favorably. The panic days we’re beginning to see this October will likely continue, with a deeper downturn following the election, if the Democrats indeed take control of the House. In such a case, gold would likely be the big winner. Gold would return to its role as a “safe haven” in times of political and economic uncertainty and rare gold coins should be in even greater demand. Several times in the last few months we have said that the late summer and early fall months are the perfect time to take some stock profits and switch a portion of your stock portfolio into rare coins and bullion. Some clients have told us that they will “wait until stocks peak” before making the switch. We, of course, argue that you don’t know when the peak of any market is until the prices start falling! That fact became clear when stocks fell 6% in just two days while gold rose 3% in one day for a 9% swing in two days. It doesn’t pay to procrastinate! Gold may settle back a little and stocks have recovered some, so there should be other opportunities to make this switch, but don’t wait too long…again. “History has shown that stock market declines can happen fast. Stock market declines happen faster and sharper than stock market increases, while the opposite is true with gold: Price increases in gold are far sharper and faster than the declines in gold prices.” Examples: Earlier this year, January 26 to February 8, the U.S. stock market declined over 10% in just 10 trading sessions. The Dow suffered two 1,000-point daily declines in one week, falling 1,175 points on February 5 and 1,033 points on February 8, 2018…. We are also approaching the 10th anniversary of the financial crisis of 2008, when the stock market fell 40% in just two months, September 19 to November 20, 2008, eventually falling 55% by early 2009. Smart investors act like the billionaires who are looking for the low population missing rare coins in their collections while prices are attractive, as they are now. I like to look for coins with an obvious “WOW!” factor. They just stop you in your tracks. It might be historical significance, multicolor toning, great eye appeal, intense luster, an appearance of power and dignity in the way the design “leaps out” at you. If you are going to collect coins, you may as well collect some of the best-looking specimens you can find, ones you can enjoy looking at yourself. Then there are those special coins you need to fill out a set. We know that complete sets can fetch 5% to 20% more than the sum of the individual coins in bull markets, just because of the added cachet of the set value. That’s usually because there are always quite a few key coins that nobody seems to be able to find. One more tip, which I have mentioned before. The final quarter of the year is the best time to buy coins. It’s a time when many dealers are trying to empty their inventory in advance of end-of-year inventory taxes. By the same token, the first part of the year into the spring is the best time to sell, if you are planning to sell coins. There are exceptions, of course. If you have specific coins your dealer needs, he will be willing to buy now, but in general the best rule of thumb is to buy extra in the fall and winter and sell in the spring. 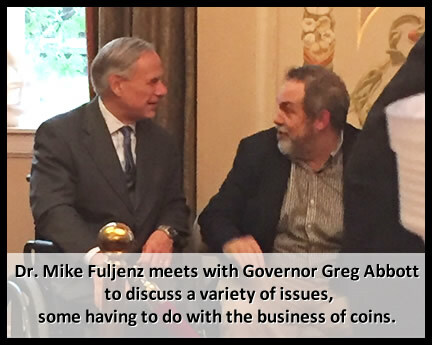 Over the years, I’ve worked with Texas State Attorney General and now Governor Greg Abbott on a variety of issues, some having to do with the business of coins – like protection from counterfeit coins but I have also worked with him and his staff on our mutual passion for youth literacy. We met again last week to discuss a variety of issues and it struck me what a genuine and self-effacing man he is for having such an important office after facing such a formidable obstacle of working his way up to that high office while in a wheelchair. Abbott was injured at age 26, just out of Vanderbilt Law School. He was jogging when a large oak tree fell on him, crushing several vertebrae and ribs and injuring several internal organs. He lay prone for a month and eventually had two steel rods inserted near his spine. These challenges made him stronger. This is the same story I learned from two other paraplegics I have met over the years. They were injured at an even younger age but went on to build great careers and businesses. Charles Krauthammer was injured while diving into a pool that was shallower than he expected. He was a quadriplegic for the rest of his life, yet he finished medical school and went on to become a leader in psychiatric medicine before ditching that career to enter political commentary and rise to the top of that field before his death last June. I also worked closely with James U. Blanchard, who was paralyzed at age 17 in his last year of high school, but he went on to pioneer the legalization of gold and helped educate Americans about gold. When I see so many millions of Americans going on disability over minor claims when they could find some form of appropriate work within their more limited range of abilities, I look at men like Greg Abbott, Jim Blanchard and Charles Krauthammer and I see some true heroic role models for our times.